In 1799, 12-year-old Conrad Reed, son of a Hessian mercenary who left the British Army near the conclusion of the Revolutionary War, made the first documented gold find in the U.S. at a spot between Charlotte and Albemarle. He spied something shiny in Little Meadow Creek, dug up what turned out to be a 17-pound rock, and started using it as a doorstop. The elder Reed sold the rock to a Fayetteville jeweler in 1802 for $3.50, when it was probably worth thousands more. In the early 1800s, you could hardly cross North Carolina without falling into a gold mine. During our gold rush, the nation’s first, many industrious men made fortunes in North Carolina. Today, you can visit the gold mine where it all began, and go to gem mines that give you hands-on experience with our state’s mineral resources and history. In the 1830s the United States government forcibly removed the southeastern American Indians from their homelands and relocated them on lands in present day Oklahoma. This tragic event is referred to as the Trail of Tears as over 10,000 Indians died during removal or soon upon arrival. Not all Americans agreed to the Indian removal; for example, Congressman David Crockett of Tennessee [who would later die fighting for the Alamo] sided with the American Indians. Christian missionaries also opposed the Indian Removal Act. They denounced the injustice of the policy. “Will not the people in whose power it is to redress Indian wrongs awake to their duty? Will they not think of the multitudes…swept into Eternity by the cupidity of the ‘white man’ who is in the enjoyment of wealth and freedom on the original soil of these oppressed Indians?” wrote Lucy Ames Butler to her friend Drusilla Burnap in 1839. Lucy’s husband was the noted missionary Elizur Butler. He accompanied the Cherokee and served as their doctor and estimated that over 4,000 (a fifth of the Cherokee population) died along the trail. 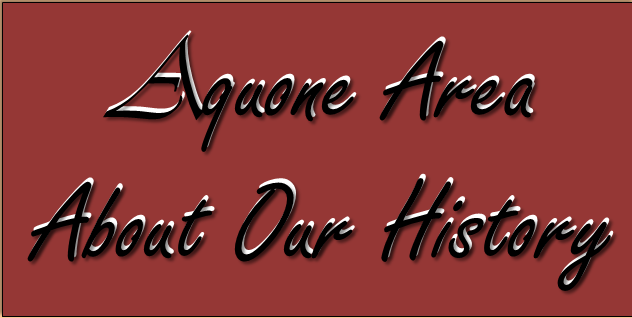 The Cherokee Indians lived in the Aquone area exclusively for nearly 4,000 years, until European traders followed Indian paths to Western North Carolina The Cherokee Indians are credited for finding this region in North Carolina. They called their “town” Aquone. 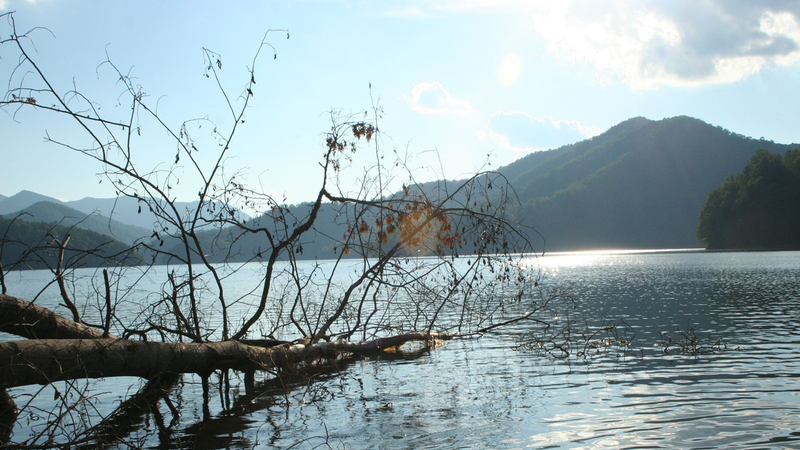 This area is now covered with water and known as Nantahala Lake. There is plenty of evidence to prove that other people lived in this area long before the Cherokee Indians were here (Lilliputian people). There are many Indian villages in the Aquone area, and other similar evidence of other villages throughout the entire Nantahala community. By the time the Civil War started there were several well-established communities of white settlers living on small farms. Like other parts of the Southern Appalachians, almost all were of Scots-Irish descent; the topography and remoteness reminded them of home. Small communities with names like Little Choga, Aquone (Cherokee: "by the river" or “where the two waters meet”), Otter Creek, Beechertown, Camp Branch and Briartown flourished with schools, churches, stores, lumber and corn mills. Many of the ‘new settlers’ married into the Cherokee families which brought peace to this newly formed community. Following Jefferson’s lead, President Andrew Jackson pushed for the passage of the Indian Removal Act of 1830. The act provided funds for the United States government to negotiate removal treaties with the Indians. The federal government coerced tribal leaders to sign these treaties. Factions arose within the tribes, as many opposed giving up their land. Cherokee Principal Chief John Ross even traveled to Washington to negotiate alternatives to removal and pleaded for the government to redress the injustices of these treaties. The United States government listened, but did not deviate from its policy. Although President Jackson negotiated the removal treaties, President Martin Van Buren enforced them. The impact of the Removal was first felt by the Choctaw. Starting in 1831, they were forced off their native lands in Mississippi. The years 1836-38 saw the Creeks, Chickasaws, Cherokees, and Seminoles forced from their homes and removed to Indian Territory. In May 1838, volunteer troops from Macon County, North Carolina, established Camp Scott as a temporary base to support the capture of Cherokees from isolated communities in the area of Aquone on the Nantahala River Valley. This militia sent most of the detainees to Fort Butler (present-day Murphy) and, from there, to deportation camps in Tennessee. At the end of June, however, the volunteers’ terms of service ended. When the soldiers dispersed, they left behind 30 to 40 Cherokee prisoners. Most of these Cherokees fled into the mountains, where they joined other fugitives. After removal, they joined the Cherokee communities at Qualla Town and Sand Town, helping to form the nucleus of the present-day Eastern Band of Cherokee Indians. Chief Junaluska (above) was a prominent leader who traveled to Washington and met with President Jackson and members of Congress to protest the Indian Removal policy. He was among the Cherokee in North Carolina who were forced from their homes in 1838. His home was a log dwelling between Aquone and Valleytown on what is now known as Junaluska Creek. After surviving the Trail of Tears, Junaluska returned to North Carolina in 1843 to try and reclaim his land. His dwelling had been dismantled and moved, but Junaluska eventually succeeded in getting lands granted to him near Robbinsville in recognition of his service during the Creek War. He died in 1858, and the graves of Junaluska and his wife Nicie are located on a hillside in Robbinsville. 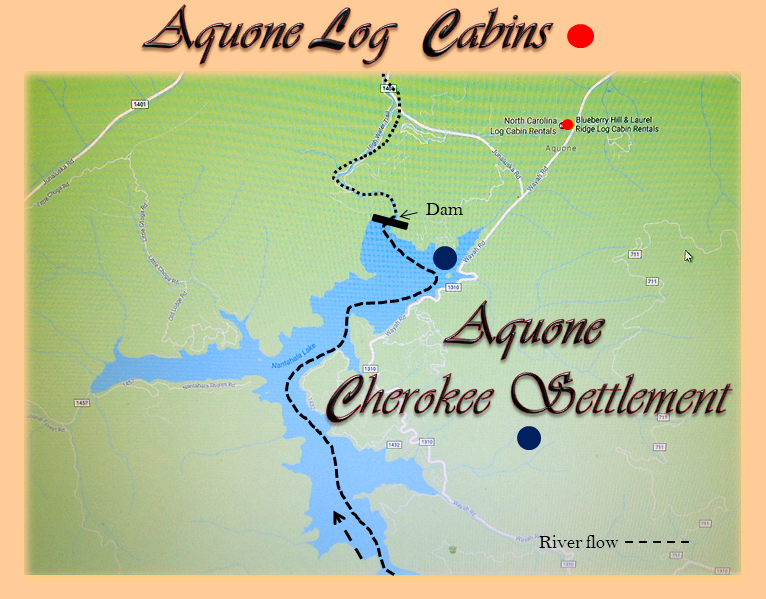 Visitor of Aquone Cabins will take the road leading from Andrews NC to the Lake Nantahala...will use Junaluska Road. All visitors to the Nantahala Community arrive as strangers and leave as friends. Wow! From the moment of our arrival I knew we made an excellent choice. Maggie and Steve are fantastic hosts and they ensured that every aspect of our stay was perfect. From guided canoe trips to whitewater rafting to zip-lining and an informative hike along the AT, our mountain experience was top-notch. The property is impeccably clean while being both cozy and rustic. You can do as much or as little as you want while staying here. When we return to this beautiful corner of the Nantahala National Forest, we will certainly stay with Maggie and Steve again. This is the perfect spot for your mountain getaway.